Lady Gaga was extremely quick to respond to the tragedy. As early as Friday afternoon, she tweeted: "I Designed a Japan Prayer Bracelet. Buy It/Donate here and ALL proceeds will go to Tsunami Relief Efforts. Go Monster." 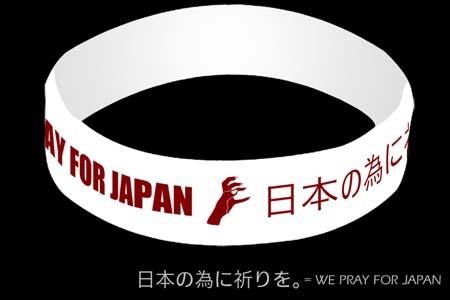 The rubber band bracelet states "We Pray for Japan" in both English and Japanese, along with an image of her signature monster paw. The bracelet is $5 and will ship out March 25th. Pre-order now. For a simple and quick donation, just text Red Cross: “People can make a $10 donation by texting REDCROSS to 90999. Their donation will go to support relief efforts for the earthquake in Japan and tsunami throughout the Pacific.” The $10 donation will be automatically billed to your cell phone statement. You can also use their donation form to give a larger amount. DONATE - Click on the general donation button in the upper right hand corner of the page or text your donation to 90999. SHARE - On the web; On Twitter; Mention it in your SXSW talks with #sxswcares and #sxsw4japan. CREATE A FUNDRAISING PAGE - Use the SXSW platform to create your own personalized fundraising page, where you can ask family and friends to contribute. Read tips for it here. All proceeds go to the American Red Cross. The Salvation Army in Tokyo immediately mobilized an effort in Sendai, reportedly the most damaged city in the region, to provide victims with food, water and other necessities. They are also providing aid in Tokyo: "Because the whole public transport shut down and stranded many commuters, The Salvation Army opened a section of their Territorial Headquarters building for those who could not get home." If you'd like to donate $10, simply text "japan" or "quake" to 80888. You can stay updated with the organization via their blog, Twitter feed and Facebook page. The above options are all quick and easy, but there are many more mobilized charities to choose from. Google posted this helpful list of organizations, all of which are prepared to accept donations now.